Oreka James, a Toronto-based artist and recent OCAD grad (2016), is an emergent painter who is beginning to make international inroads via Los Angeles. Deservedly so. James' recent paintings make powerful statements about the objectification of the black body. The black figures in her painting are headless. They are fragmented, abject, and ultimately objectified by this brutal stripping of identity. Because this anonymous state is how the viewer witnesses these figures, James renders the viewer complicit in the objectification to send a powerful message about inherent stereotyping in white cubes and beyond. What grants buoyancy to this potent, pointed criticism is James' skill as an imagist, as her painting Idle Hands attests. It's the unanswered questions, the lingering ambiguity, that seduces us. For instance, is the white hand doing "the devil's work" by appropriating the drawing on the wall it reaches around? 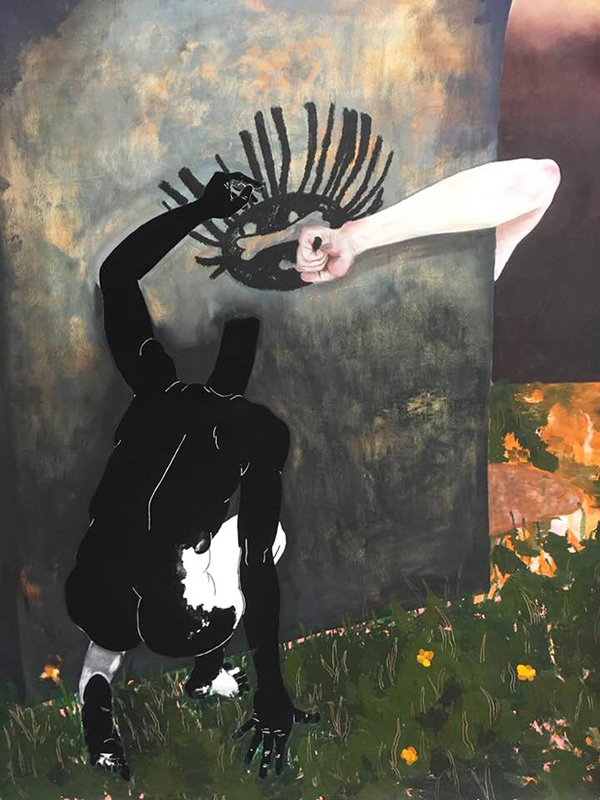 One may see this and other intriguing work by BIPOC artists such as Tau Lewis and Camille Turner in one of the most, if not the most, memorable exhibitions in Toronto this summer: RAGGA NYC, at Mercer Union until August 11.